This was a fun project, one I tried just because I hadn’t done it yet, like making a RR spike knife or forging a tomahawk. I don’t plan on doing it again however, I prefer bowies. I started out as usual, sketching out the design, but this time doing a cutaway diagram. 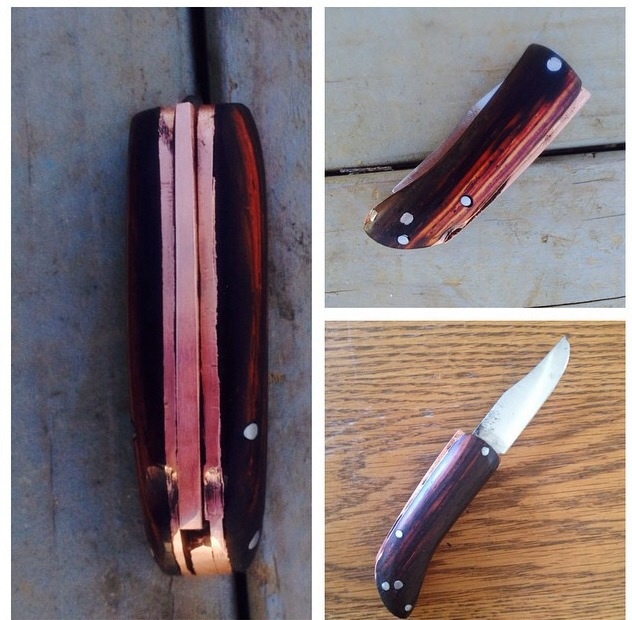 I based the locking mechanism off this one, basically called the “lockback” folder. The construction is fairly simple, a lever in the back of the handle, the front of which pushes down like a puzzle piece into the knife blade. Only by pushing on the other end of the lever does it push up and out of the blade, allowing it to rotate. I started with the blade, forging a 2 inch or so blade out of 1084, normalizing, and grinding. After I got the blade to the shape I wanted, I flattened out copper, thin enough to minimize weight and look slim enough, but thick enough to be annealed and not deform easily, about twice the thickness of a dime. 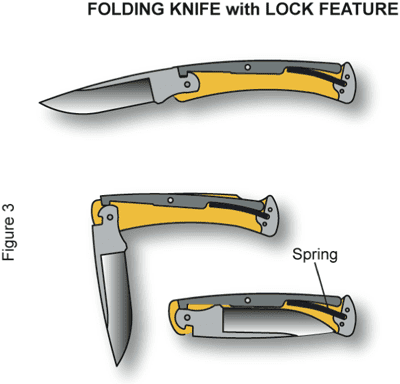 Using the blade as a guide, I re-sketched the folder in cutaway form, and cut the copper sheet to two dimensional shape (matching the yellow in the above diagram). After I had one piece cut out thus, I cut out a second one, clamped them together with a C-clamp and ground them flush on the belt grinder. Once this was done I marked where to drill the holes for each pin, and drilled them in. After deburring the holes I began working on the lever arm and the blade itself with files, matching the two so as to fit perfectly. From time to time I would compare it on one or the other copper frame pieces, using rods as temporary pins to make sure they worked and fit perfectly. Once I was confident it would work well, I cut out a back piece to give structure in the space between the frame pieces, and drilled it to fit accordingly. I constructed it slightly different from the diagram, using a torsion spring, with one arm between a pin and a back piece and the other arm pressing up against the rear lever arm. After test fitting it all, I began working on the scales, choosing two pieces of cocobolo that had a lighter streak running through them. I cut out the rough shape, placed under the copper frame pieces, and drilled in all the holes. Using these holes for temporary pins, I lined them all up and clamped them together, which I then ground flush on the belt grinder. Once this was done I unclamped them and shaped the scales individually. Looking back I realized I should have ground them thinner. Finally, once I knew all the pieces fit together, I did the final assembly, placing down one scale, pins through each hole, epoxy on top of the scale, one copper frame on top of that, blade, lever arm, back piece, and spring on top of that, and another copper frame on top of those. I had to hold down the lever arm and spring pretty tight with one hand and sliding down the second copper frame above quickly to keep it from popping apart. Very stressful. After that I spread on some more epoxy, then the second scale on top, using a c-clamp to keep it all together. Afterwards was the home stretch, clipping the pins and peening then grinding them flush, and sanding down the wood to a high grit and oiling, then finally sharpening. I had some complications with the spring, which required taking out a pin, replacing the spring, and putting the pin back in, which was very stressful and at time frustrating, but I got it all together. I’m happy with the result but not intent on trying it again, at least until I get more precise equipment. This entry was posted in Uncategorized on March 16, 2015 by Captain Belaq.